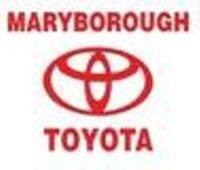 Royal Park went into the game against Navarre full of confidence after winning six games in a row and felt that they had a big chance to stop Navarre’s winning run, however it was the Grasshoppers notching their 31st consecutive win with an eleven point victory to keep them on top of the MCDFNL ladder. 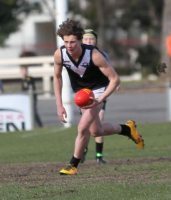 Navarre went into the game without five of their better players including Coach’s Daniel Parkin and Brent Flood, star forward Ash Driscoll, ruckman Rhett Murphy and young gun Riley Bibby, but showcased their incredible depth to ensure victory against a strong Royal Park lineups. The Grasshoppers started the opening term strongly and had three goals on the scoreboard inside eight minutes. Louis Hannett and Daniel Reading were getting plenty of ball out of the middle due to the outstanding ruck work of Josh Fowkes and the Tigers were second to the ball as Navarre led them a merry dance to finish the first quarter with six goals on the board to Royal Park’s two goals. The Tigers fought back in the second term and if not for missed opportunities could easily have taken the lead, but Josh Brown’s accuracy was a saving grace as the big forward kicked three goals for the term as the Tigers got to within seven points at the 20 minute mark, only to allow the Grasshoppers to score two late goals through Cody Driscoll and Louis Hannett which saw Navarre lead by 19 points at half time. The third term was a tough encounter, but it was Navarre that took the upper hand with their youngsters in Josh Fowkes and the Slorach brothers giving them the advantage. Fowkes scored two goals for the term and Cody Driscoll kicked his third goal from a mark in the goal square. Jake Pring was outstanding for Royal Park throughout the game and he provided some hope with a late running goal that reduced the margin to 25 points just on three quarter time. 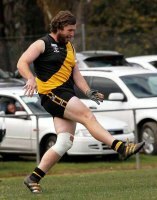 As in most games this season, Royal Park continued to fight out the game in the final term, and early on it was Josh Brown that kicked his fifth goal of the game and the Tigers faithful were full of voice, but Lachlan Slorach marked a Nick Murphy pass and kicked truly from thirty metres out to dampen the spirits of the Tigers supporters. Late goals to Jake Pring and Jay Anderson reduced the margin to 12 points, but Navarre were up to the challenge and won their 31st game in succession by the final margin of 13 points. 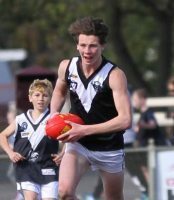 Navarre was well represented by Lachlan Slorach, Josh Fowkes, Louis Hannett, and Sam Kaye, Jayden Fowkes and Danny Grellett were also amongst the better players. Royal Park’s better players were Stefan Pyre, Jake Pring and Josh Brown (5 Goals), while James Sutherland and Jay Anderson also battled hard throughout the encounter. A nine goal haul from returning spearhead Nathan Wright has seen Carisbrook continue on their dominant way with a 95 point victory over Maldon on Saturday at the Bill Woodfull Reserve. Wright was in very accurate form as he returned from suspension and he was well supported around the goal mouth by Ryan Hudson-Morgan with four goals to his credit. 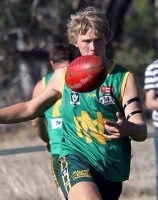 Matt Bilton and Nathan O’Keefe continued their good form from the previous week against Avoca as did Matt Jukes. Maldon gave a very good account of themselves in the opening term, but the Redbacks dominance took control for the remainder of the game. Maldon’s better players were Shain Burchell, Hayden Kelly and Dean Primmer, while Josh Pascoe again provided good service in the ruck, but their efforts were to no avail as Carisbrook were too strong in all areas of the ground. 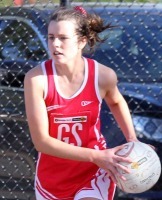 A thrilling encounter at Talbot Recreation Reserve on Saturday saw Talbot win their second game of the year in a two point nail biter. The Hawks got off to a flying start to game, taking Avoca by surprise as Luke Kemp kicked three goals early in the term, but the visitors regrouped and answered the challenge by posting the next six goals in succession, and the Bulldogs supporters were thinking that they were headed to a comfortable victory, but it was not to be, for after an even second term, the remainder of the match saw Talbot in control of the game. 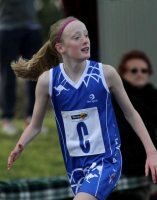 It was disappointing for Bulldogs supporters that Avoca could only score two goals for the second half of the game, while Talbot managed to score five goals. The game was in the balance with scores tied late in the game, but Josh Sullivan managed to score a behind to take the lead for the Hawks, then another behind was scored just before the final siren to see the Hawks win their second successive game, after being winless until the previous round. Talbot’s smaller players had too much pace for the Bulldogs and it was Luke Kemp who was the best player for the Hawks and his four goals played a big part in the victory. 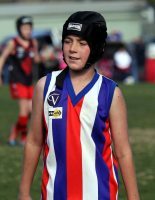 Kemp was well supported by Kallan Boucher and James Collings, and Trent Barras also scored three goals for the victors. Avoca’s Rangi Vickers was again judged their best player for the fourth week in succession, while Taylor Hall played well after returning from injury, and Bryce Howell and James Walton also were amongst the Bulldogs better players. 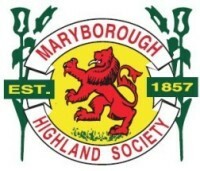 Harcourt survived a major scare at the hands of Newstead in round nine of the Maryborough Castlemaine District Football Netball League with the Lions slipping away with a one-goal win. After suffering their first loss for the season at the hands of Natte Bealiba in the previous round, Harcourt was lucky to escape with a win, sneaking home over the Roos 14.11 (95) to 14.5 (89), with a four-goal haul to recently-returned forward Matt Giri the catalyst for Harcourt’s victory. In a high-scoring opening term, Newstead managed to improve on its recent sparte of poor startsm booting four goals, however the Lions slotted six majors in reply to open up a 12-point lead at quarter time. The free-flowing game ground to halt in the second term, with both sides struggling to continue their attacking style of football, as Harcourt booted two goals to Newstead’s one, stretching the Lions’ lead to 19 points by the major break. The high-scoring football made a welcome return after half time, as the Roos struggled to stay in touch with a Lions side intent on breaking the resolve of their young opponents, as Harcourt piled on four goals to Newstead’s three, with the lead reaching 28 points at the final change. However Newstead responded in style, with the young Roos taking it up to Harcourt in the final term and refusing to give in, resulting in an arm wrestle for ascendancy as the final quarter stretched on. However it was the Lions who ran out winners, with Giri’s haul of five goals backed up by three majors from coach Sean Smith, while Brendan Josey, Kyle McLean, Jack Douglass and Alex Birch were the Lions’ best performers. Jonty Entwistle spearheaded Newstead’s attack with four goals, while Adrian Conn, Oscar Lynzaat and Joel Smith each slotted two. Lynzaat, Ash Webster, Dale Bott and Cameron Hepburn were named Newstead’s best in a gallant effort by the Roos. 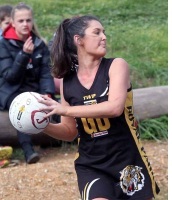 Lexton has fired a warning shot to its competitors, with the Tigers ramming home their premiership credentials courtesy of an 83-point victory over Maryborough Rovers. An eight-goal haul to spearhead Matt Brown helped the Tigers complete the demolition job of the Magpies, 28.10 (178) to 15.5 (95). 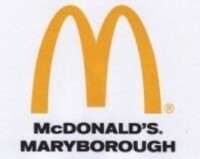 In one of the highest-scoring games the MCDFNL has seen in 2015, the Tigers kicked a massive 8.5 (53) in the opening term, despite Maryborough Rovers also booting six opening term goals of their own. 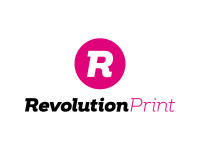 The all-out attack from Lexton continued in the second quarter, piling on another eight majors, while Rovers were unable to keep the pace, able to contribute just one goal of their own, with the scoreboard showing Lexton well in control at half-time, 16.5 (101) to Rovers’ 7.1 (43). The pain continued for the Magpies after half-time as well, with Lexton drilling home another seven goals, despite the Magpies mounting a six-goal fightback of their own in the third term. 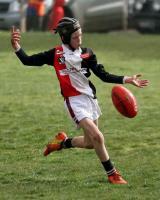 While the relentless attack from Lexton did let up slightly in the final term by their standards, with just five goals, the Magpies also showed signs of fatigue from the shootout, kicking just two goals of their own. Along with Brown’s bag of eight, plenty of other Tigers got in on the goalkicking action, with Lachlan Murray booting six majors, while Justin White, Mitchell Kennedy and Scott Clark all snared three and Bryce Karslake managed to steer home two. Clark, Brown, Jordan Phelan and Kennedy were named the Tigers’ best in the stellar performance. Karson Guareschi continued his good form in front of goal for the Magpies, booting five goals, backed by three each from Bryce Fletcher and Dylan Gibson, while veteran Brad Fraser kicked two. Utility Brendon Hedger was named Rovers’ best along with Brayden Guareschi, Fraser, Karson Guareschi and the impressive David Popovski. 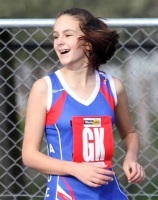 Natte Bealiba has continued its impressive run of form, with the Swans demolishing Trentham by 90 points on Saturday. The Swans easily overcame the Saints on Trentham’s home turf, scoring their seventh win of the year in style, 18.23 (131) to 6.5 (41). While Natte’s poor kicking in front of goal continued, there was little reason to worry this round, with the Swans booting 4.7 in the first quarter to establish an 18-point lead by quarter time. Things could have been much worse for the Saints by the time the half-time siren was blown as well, with Natte’s goalkicking preventing a major blowout, heading into the main break with a 37-point lead, 6.15 (51) to Trentham’s 2.2 (14). Natte’s forwards found their radar after half-time, returning to the field to boot eight third quarter goals and extend the lead to 67 points at three quarter time. The final term yielded little relief for Trentham, with Natte drilling another four goals to Trentham’s one, resulting in one of the Swans’ most impressive victories this season. Adrian Pilgrim and Zac Perez continued their double act up forward with four goals apiece, backed up by Stephen Ross and Matt Stagg with two each. Assistant coach Jarrod Bateson continued to shine for the Swans with yet another best afield honour, along with Perez, Stagg and Ross. Big man Mark Strickland booted three goals for Trentham, while Callan Wellings, Chris Whelan, John Cowell and Lewis Bruton were Trentham’s standouts. Creek had eleven shots on goal in the opening term which realized three goals and eight behinds, and eleven shots on goal in the second term produced four goals seven behinds, keeping Dunolly in the game at half time only trailing by twenty three points. 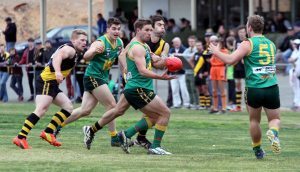 It did not really matter though as the Creekers accuracy improved in the third term and a seven goal haul put the Eagles out of reach on the scoreboard. Dunolly did not help themselves though as they continually turned the ball over coming out of their defensive half. 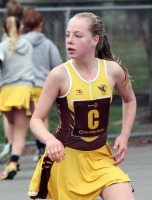 Mick Campbell was the exception and was once again solid in defence for the Eagles. With the game safe in its keeping the final quarter was a dull affair with Creek scoring only two goals and keeping the Eagles to just one solitary behind for the term. 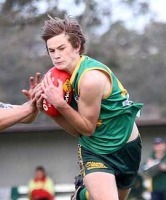 Carl Simmons, Luke Ashmore (5 goals) and Brandon Greenwood were the better players for Creek in a strong team effort while James Blackwell, Joey Thompson and Jamie Townsend were amongst the Eagles better contributors.